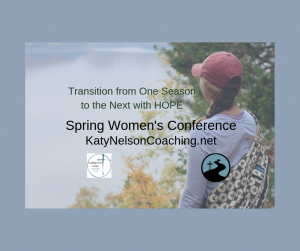 Conferences and Retreats offer times for women to grow, connect and get away from the activities of every day life. KatyNelsonCoaching.net also offers facilitation for your event. Contact Katy if you are interested in scheduling with her. Exploring where you are in this season of life! Kids graduating? New baby? Newly Married? Seasoned in life and wondering what is next? Relationship changes through death, divorce or other circumstances? Finding YOU through Transition in Life offers speakers who have been in your space; allows time away for your to think and process; and concludes with challenges to move you forward.